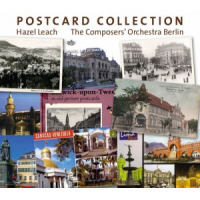 These picturesque "postcards" from composer / arranger Hazel Leach's well-appointed Composers' Orchestra Berlin are addressed to various locales in Europe and South America, presumably designed to echo musically the special nature of each site. Oddly enough, as there are only eight cards to be delivered, the album opens with Postcards 10 and 11, aimed at Caracas, Venezuela, and Tucuman, Argentina, respectively. There's a Postcard 9 as well, directed to Kalavrita, Greece, and one unnumbered memo, "Postcard aus Schlabendorf am See," which apparently is in Luckau, Germany. The last three cards are, in fact, addressed to precincts in Deutschland including No. 5, "Bonn," and arguably the most intriguing of them all, No. 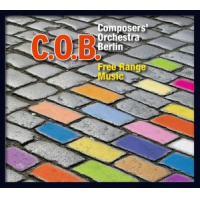 2, labeled "Berlin 1929," wherein the COB turns back the clock, as it were, summoning the spirit of pre-war Berlin to ring down the curtain with a seductive waltz that brings to mind music from Kander and Ebb's Broadway smash (and later film) Cabaret. Leach wrote and signed that card, as she did all the others, affirming once again that she is one of Europe'sand the world'smore erudite sculptors of contemporary big-band jazz. About the rhythmically pleasing opener, "Postcard 10 Caracas," Leach writes that "the composer and pianist Claudia Calderon has translated the traditional harp rhythms of Venezuelan folk music into her piano style," which is rather confusing given that Calderon is not listed as the pianist here and the booklet notes that "all compositions are by Hazel Leach." As pianist Fee Stracke is among the soloists, it must be assumed that he (or she), and not Calderon, is at the piano, as is the case on "Postcard 11 Tucuman" and "Postcard 8 Lima." The other soloists on "Caracas" are drummer Tom Dayan and trumpeter Aaron Schmidt-Wiegan. The dark-hued "Tucuman" slows the tempo considerably, sauntering sternly behind its featured artist, tenor saxophonist Tian Korthals, before the light shines again on "Postcard 7 Berwick upon Tweed," whose dancing melody gives way to a sunny statement by alto saxophonist Ruth Schepers before the ensemble grasps the reins and ushers the steed across the finish line. "Postcard 8 Lima" is another rhythmic delight, its easygoing nature enhanced by trombonist Anne Dau's purposeful solo. "Postcard 9 Kalavrita" opens with an air of mystery before easing into a tango-like dance with Israeli overtones (based, Leach writes, on "the nine-beat pattern of rebetika music") whose earnest soloists are clarinetist Mieke Goosmann and violist Katja Braun. "Schlabendorf am See" is dense and deliberate, marching (one should say waltzing) leisurely behind decorous statements by Schmidt-Wiegan, Korthals and violinist Daniel Friedrichs. "Postcard 5 Bonn," Leach's "personal homage to Beethoven," uses a moderate tempo and overlapping phrases to underscore brief solos by pianist Heiko Kulenkampff and guitarist Daniel Meyer. That leads to "Berlin 1929," a salute to the city's pre-war dance halls whose clear-eyed soloists are Goosmann and trumpeter Nikalous Neuser. It's a provocative coda to an album whose myriad facets may seem challenging to some listeners but should abundantly reward those whose hearts and minds are attuned to new approaches and ideas. Track Listing: Postcard 10 Caracas; Postcard 11 Tucuman; Postcard 7 Berwick Upon Tweed; Postcard 8 Lima; Postcard 9 Kalavrita; Postcard aus Sclabendorf am See; Postcard 5 Bonn; Postcard No. 2: Berlin 1929. Personnel: Hazel Leach: leader, composer, arranger; Aaron Schmidt-Wiegand: trumpet (1-7); Nikolaus Neuser: trumpet (8); Meike Goosmann: sopranino recorder, clarinet (3, 5, 8); Ruth Schepers: alto sax (1-7); Tian Korthals: tenor sax (1-7); Markus Busch: baritone sax, bass clarinet (1-7); Anne Dau: trombone (1-7); Janni Struzyk: tuba (1-7); Daniel Friedrichs: violin (1-7); Claudia Autuori: violin (1, 2, 4); Matthias Leupold: violin (3-7); Raphael Armin: violin (8); Katja Braun: viola (1-7); Susanne Paul: cello (1-5); Frederico Malverde: cello (6, 7); Martin Klenk: cello (8); Fee Stracke: piano (1, 2, 4); Heiko Kulenkampff: piano (3, 5-7); Daniel Meyer: guitar (1-7); Dirk Strakhof: bass; Tom Dayan: drums, percussion.